January brings with it a new season of the increasingly popular "Street Talks" from the Movement for Liveable London. 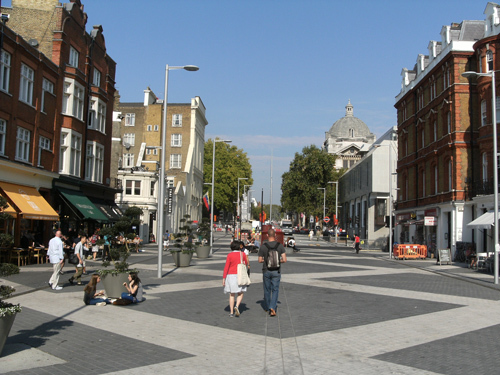 Kicking off the new year, next Tuesday's talk will explore a very hot topic currently in UK street design; shared space. The completed southern section of Exhibition Road. Picture via RIBA blog. Will shared space really reclaim the public realm back from the motor car? Are the aesthetic benefits greater than more tangible benefits for walkers and cyclists? And what of universal access issues; can the vision impaired navigate such spaces successfully and will impatient London motorists have the courtesy to find out? Is it simply the case (as in Exhibition Road) of acknowledging that anything is better than what was there before and having to wait and see? Perhaps the key to successful new street design - whether shared or separated - lies in answering that most difficult of questions; how do we reduce the volume of motorised vehicles wishing to use it? January's Street Talk will be delivered by Stuart Reid, Director of Sustainable Transport and Communities at MVA Consultancy. Stuart is a prominent figure in the field of sustainable transport, with a particular interest in walking and cycling. He has contributed to the development of national policy and key guidance for planning, process and design. Upstairs at The Yorkshire Grey, 2 Theobalds Road, WC1X 8PN at 7pm (upstairs bar and restaurant open from 6pm) next Tuesday 10th January. To hear of future events sign up the mailing list, and to listen again to all previous talks jump on over to the excellent Movement for Liveable London website. I cycled down Exhibition Road a few days ago (on a Boris bike no less) and I have to say it's a slight improvement on what was there before. My overall feeling though is that shared space doesn’t work with motorised traffic on a through road, however nicely it's been landscaped. Sadly, this is yet another lost opportunity to create a genuine pedestrian area. I still wouldn't let my 11 year old cross the "road" from the entrance of the Science Museum to the V&A. Submit your blog RSS url in zeole.com/london . This is a one time submission. This would automatically submit a preview of your latest blogpost in London with a link back to your blog. I'm never sure about Shared Space. We have a lot of 'play streets' locally which are basically shared space with a 7km/h (4mph) speed limit. It works fine until some commuter decided to blow through at 40km/h, at the time children are going to school. In the dark. Then there's nowhere to go except between parked cars. There are a lot of children around hee, but even on the play streets their parents don't want them going outsode. I cycled up this road yesterday. I found the zig zag pattern confusing, as was the odd single lane of traffic. I didn't know whether I was supposed to cycle on the pedestrian bit or the road bit; and I am fed up with being used as a moving chicane to regulate the speed of cars. Most heinous of all is that there are NO BIKE RACKS for the Science Museum, or for anywhere else that I could see. The only ones in the whole road are the existing ones on the corner by the V&A. Each lampost/road sign had a bike attached. I added mine to a bench. Stupid waste of money.